On September 20-21 I went to a revitalization conference in York, NE where Brian Croft was the main guest speaker. I had already read a couple of his books, listen to his podcast, and read a few blogs. I wanted to hear him preach and see what he was like in person. Plus, I wanted to meet a couple of online associates/friends, and get to know them as well. While at the conference, I picked up a number of Croft’s books (co-written, solely-written, or foreword-written). 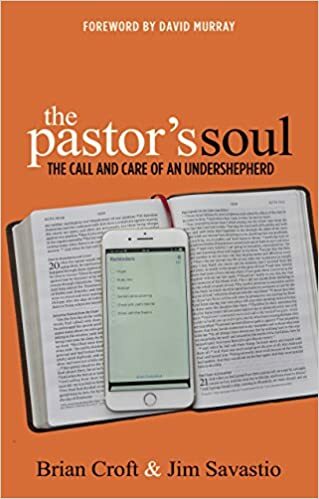 Among them was The Pastor’s Soul: The Call and Care of an Undershepherd, co-written with Jim Savastio. Both Croft and Savastio are pastors in Louisville, though at different churches: Auburndale Baptist and The Reformed Baptist Church of Louisville respectively. Both have been in the ministry for years and both seek to live out what they have written, though both do so imperfectly, admittedly. The Pastor’s Soul is part of a trilogy and just recently came out earlier this year. It is the last of the three-part series, The Pastor’s Family and The Pastor’s Ministry (both of which I will be reading soon and writing a review–stay tuned). However, I wanted to read this particular book first because of personal reasons. I too have been in the ministry for years, and over the past year or so have come to realize that it is easy to neglect one’s own soul while tending and caring for those in the flock. When I heard the book was in the works, I was excited. When I heard it was published, I was thrilled. When I read the book, I was inspired. As I wrote earlier, I only picked this book up on the 21st of September. I didn’t get a chance to read it until that Monday, September 24. I finished it Saturday (September 29) afternoon. While it is only 154 pages long, I tend to read slowly seeking to absorb as much as I can. By the end of Appendix B, I had soaked in much wisdom, and had related to many of the experiences within the pages, vicariously living through others. There are four parts to this book: Part 1: Biblical Commands Concerning a Pastor, Part 2: Pastoral Call Upon a Pastor, Part 3: Spiritual Care of a Pastor, and Part 4: Physical Care of a Pastor. Perhaps I am being a bit “of the flesh,” but I was grateful that Croft and Savastio did not spend a great deal of time referring to the biblical requirements of a pastor. There is a chapter where this is covered, but I’d venture to say that both authors figured that most who read this book are familiar with 1 Timothy 3 and Titus 1’s requirements. They summarized the requirements quite nicely, but did not belabor them. That being said, what they did seek to do is show what and why a pastor is called to tend, not only his flock, but himself. From the first chapter, “Take Heed to Yourself,” I was hooked. “God does not see you first and foremost as a pastor, he sees you as his child. He sees you as one whom he set his love on before the foundation of the world. His view of you is not dependent on how well or poorly you have performed in your office,” (p. 28). It is easy to preach that to others, while not acknowledging it in one’s role as a pastor. In today’s ministry, with all the mega-churches, and all the conferences geared toward bigger, better ministries and sermons and such, it is good to be reminded that God is not impressed with our success, but loves as a father loving a child. The book continues with explaining why it is that heeding yourself, heeding your flock, and heeding your doctrine are so vital in pastoral life. Chapter 5 is the chapter on the pastor’s calling and qualifications, leading into chapter 6 where the pastor is shown the need to acknowledge his weakness and his dependence on Christ. One of the most meaningful chapters though, for me, was the seventh one; it’s about the pastor’s love. Being one who tends to keep away from emotions, it was eye-opening to read truths such as, “We cannot suppress emotion out of fear and then assume we can somehow still feel deeply,” (p. 83), and “A courageous pastor loves deeply as he risks feeling deeply,” (p. 84). Part 3 (Savastio) quickly dealt with the pastor’s need to care spiritually for his own soul. Thus he needs to be under the word as much as those in his flock. He needs to read/study God’s Word outside of sermon prep, and listen to the exposition from other pastors, live is best, but other ways if one can’t be there in person. It was Part 4 that was most practical. There, Brian Croft speaks to the physical care of the pastor including his need to know how much sleep he needs, how easy it is to stress-eat and neglect exercise, along with some other chapters about taking care of this temple that houses the Holy Spirit. All in all, this was a great read and one that, while I had to put down to do my pastoral work, I looked forward to picking back up time and time again. I am looking forward to the other books in the series, as this one had a great impact on my soul as I am sure it will for any pastor who will read. I would encourage “the flock” to read this as well, so that they know how to help a pastor who is neglecting his own soul-care. If you care about keeping your pastor healthy and burnout-free, then read this book and implement its advice.